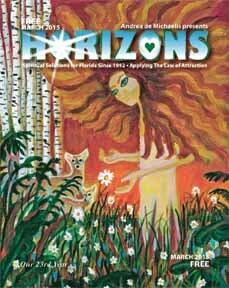 Hello and welcome to the March 2015 edition of Horizons Magazine. It was refreshing to have a little taste of winter, but Spring is definitely here! Along with the cooler weather came a giant head cold that made me low energy for 10 days. It’s a different kind of meditation when I’m taking meds for a headcold. The sounds in my head increase as I tune into the sinuses singing. As I breathe prana thru the nostrils, I feel detached, as if the giant thunderhead is not a part of me. When the nostrils clog up and I breathe thru my mouth, I feel my consciousness rise outside the body, observing its aches and pains without being too involved in it. Until the next breath. Times like this when my body gets knocked down a bit, I realize I live in my mind WAAAAAY more than I live in my body. Yay for being in control of my own thoughts. A vision of Sai Baba and Amma in… IHOP? I woke up hungry on Day 6, with an appetite for the first time since my head cold began. On the way to IHOP two miles away, I see a familiar figure, a somewhat scruffy looking gentleman in a wheelchair, heading east. I saw him last week in the parking lot at Publix near Wendy’s, eating under a tree next to the duck pond. Living near an I-95 exit, I see a lot of homeless in transit. I didn’t think more about it. I went inside and ordered breakfast: a spinach and mushroom omelet with no pancake batter, no cheese and no hollandaise sauce, dry rye toast. As I sat drinking my coffee, he came in and was seated at the table next to me. I got a good look at him. He appeared sun weathered, dirty and dusty from the road. He held up his hands and said “They are dirty from the wheelchair.” I asked if she could bring him a wet cloth for his hands and he said, “Yes, please, thank you.” I didn’t feel I was butting in. He had a hard time getting the words out and the server was young and seemed like she didn’t know what he really wanted. When the server walked away, he turned to face me and suddenly the dirty, scruffy guy in the wheelchair was replaced by the form of Satya Sai Baba (Swami) who was smiling and laughing. The entire scene telescoped and it was just he and I. I feel a kundalini rush and was suddenly overcome with wanting to drop to his feet, knowing who He was. I mean, I was aware that I was having an internal vision as I was sitting in an IHOP, surrounded by people who had no idea what was happening. I also knew it didn’t matter if I dropped to my knees at his feet or not, He knew and I knew what was happening. I was overcome with Joy at the private interchange between us. I knew it would go on as long as I held my gaze upon Him. I knew from experience that as soon as I glanced away, the Moment would be gone. And it was. I went back to my coffee as he went back to his. A moment later I hear what sounds like a fork dropping to a tile floor. I look up and see he’s got his fork (and there is carpet beneath us, not tile.) But now he’s turned into the form of Amma, Mata Amritanandamayi, The Hugging Saint. Again, there is the telescoping of the entire scene into a pinpoint focus and it’s only Amma and I, and she is smiling and laughing. Again I am overcome with the urge to drop to my knees at Her feet and again I realize I am in the middle of the neighborhood IHOP and it would probably draw a lot of attention. The attention is irrevelant, I know this is all about ME and HIM/HER — God in whatever form. I realize this is walking the razor’s edged path, living in both worlds at once. I knew it was irrelevant to Swami and to Amma whether I acknowledged Him/Her publicly. They knew what was in my heart. They knew that I knew that They knew. Again, I held the gaze as long as possible and then the Moment was once again gone. I got up to leave and he half turned to the side and half looked up and again said Thank You. I touched his dirty hand with both of mine and said Thank You back. I paid his bill when I paid mine and asked the server not to tell him who had paid it. Like a lover having had a glimpse of The Beloved, I didn’t wash my hand for hours, not wanting to break the spell. Get in a meditative state of mind where you can have 30 minutes to yourself. Bring to mind a happy place, a peaceful place. A place where you can detect the presence of God. Can you detect the presence of God there? Can you invite ____ into this scene with you, to share in the presence of God? What emotion do you feel? What emotion do you feel when you invite ____ into the scene with you now? I’ve done this process with husbands, with exes, and friends who had passed. Some I felt the hurt and grief released after one session. Some I had to do the process 4-5 times before I felt it go. Accept all things. It’s the only way to wake up…anything else perpetuates the dream. This entry was posted in Uncategorized on March 1, 2015 by Andrea.